After over 25 years, Adventures in Odyssey has released some long-lost episodes from the vault! “The Officer Harley Collection” is now available to all members of the Odyssey Adventure Club! 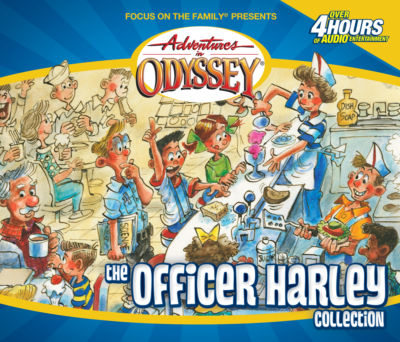 Officer David Harley appeared in a number of early Adventures in Odyssey episodes. He was voiced by Will Ryan, who later went on to voice Eugene Meltsner. Harley was a bumbling policeman and the producers loved him for his comic potential, but not everyone felt the same way. After parents complained that he gave a bad impression of law enforcers, the team decided that Officer Harley should leave the show. Many of his episodes were later rewritten, retitled, and rerecorded without him. A few others were dropped completely and never aired again. Over the years, we’ve looked for a place to re-release these episodes as interesting curiosities so fans could hear the originals. And now, with the Odyssey Adventure Club, we’ve finally found the perfect place. Enjoy these episodes that haven’t been heard in more than twenty years! The Odyssey Adventure Club is packed full of 700+ Adventures in Odyssey episodes, exclusive adventures, activities, devotionals, and more. At the moment, “The Officer Harley Collection” is exclusively available for streaming through OAC… another great reason to become a member. And for all the long-time and die-hard fans who have been waiting for so long, this is your lucky day!